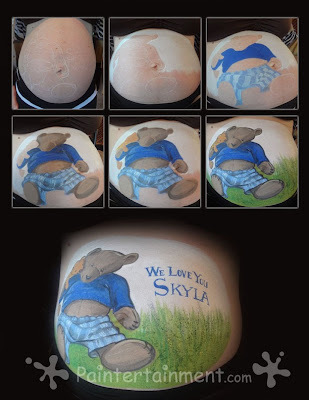 My Latest Belly Painting: "You Are My I Love You"
I had the honor of painting another baby bump this weekend! 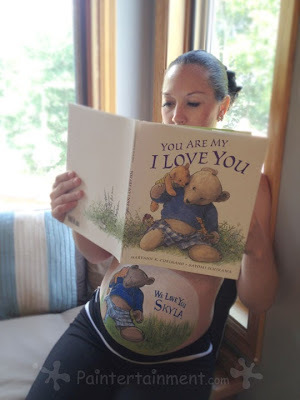 The image chosen came from this adorable book, "You Are My I Love You." I ordered a mini version on Amazon so I could read the story and see some more images...very sweet book if you haven't seen it! Here are the tools and supplies I used. 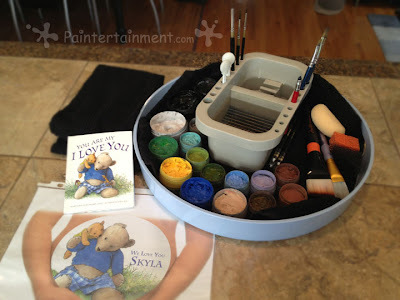 For belly paintings I like to use this round tray lined with a towel. 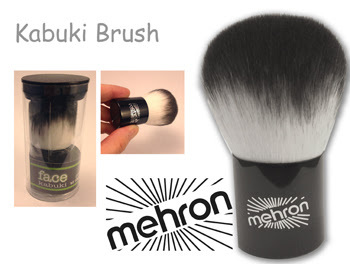 It has nice, tall sides for me to easily carry my kit around without dropping things! I get out only the colors I know I'll need since we work out the design in detail before we begin. You can see my Photoshopped rendering of the belly design above, which I use for reference, but mostly to nail down the design ahead of time with the mom. Here are some progress shots! I start with a white makeup pencil while mom stands, and then have her sit while I paint, so that the design isn't distorted later when she stands up. You can see below how much bellies change shape standing vs sitting by comparing the 1st and 2nd shots below. All the paints were Kryolan, except for the white which was Wolfe. I used a combination of sponge and brush to lay down the white background, and did the whole painting with three different sizes of Wolfe round brushes (#1, #4, and #8. ), except for the stripes on the bear's shorts where I used a small flat brush. I added some texture to the grassy field using my black pore stipple sponge and that worked great! Are they not the cutest couple ever?!?! 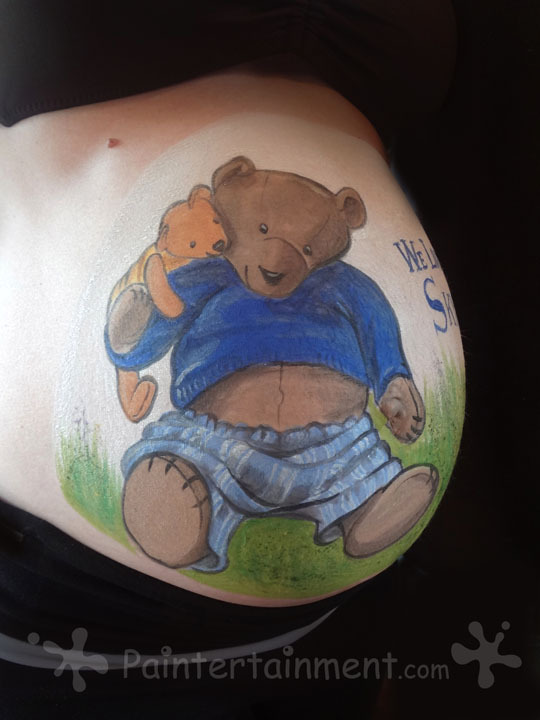 Thank you so much for letting me paint your beautiful bump!! 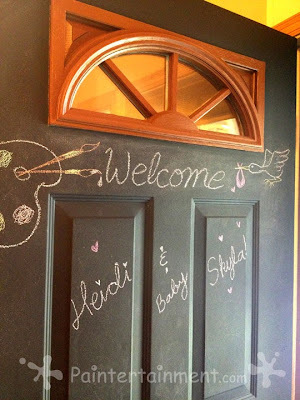 If you're thinking about having a baby bump painting, you can find out more on my belly FAQ page! Final Farewell to the Dakota County Fair! It is with a heavy heart that I must say goodbye to my faithful customers at the Dakota County Fair this year, after spending the last 15 summers painting there! While I am excited for my new ventures this summer, I am most saddened by the fact that I was not able to let everyone know last summer that it was my last year, as I myself didn't even know at that point. So, in an effort to offer an explanation to my customers and bid them a fond farewell, I am doing this blog post! Over my past 15 years painting at the fair, many times there was at least one other face painter who would show up in one of the commercial exhibitors' as a freebie...meaning companies would hire a face painter by the hour (or get volunteers) to paint kids for free as their way of drawing people into their booth (representing a completely unrelated business). When this happened, I would simply check with the folks in the fair office to see if they were "legal," and they have always taken care of it right away if they weren't. As vendors, we are all required to list every item that we have available at our booth in our contract, whether it is for sale or free, and not everyone necessarily complied. While a huge state fair may be able to support multiple face painters, a county fair just cannot. For my first 14 years the fair authorities have been totally understanding and wonderful at enforcing this. Of course, they've added temporary tattoos and henna since I started the fair, and I've enjoyed working with these other vendors too! There are plenty of customers to go around for all the different types of "body art," but it just is not fair to anyone to have multiples of the exact same offering. 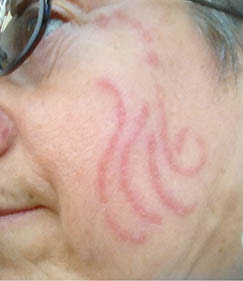 In 2012 a face painter was allowed into the fair as another commercial vendor's "freebie," and for whatever reason, after my repeated attempts to warn them of the dangers of unsafe paints and my inquiries as to whether they had listed this in their contract and ensured it was safe, the fair authorities simply did nothing, or at least never responded to me either way. Now being that they never answered my questions, I'm not sure if this painter was listed in the commercial exhibitor's contract or not. They could have been documented and following the fair rules and the fair simply looked the other way, not concerned at how they were affecting my business. But by allowing them to stay and continue painting for the entire week, they were basically letting every commercial exhibitor know that it was okay to bring in free face painters to draw in people to their booth, opening the doors wide to unlimited free face painters in the future. And let's face it, face painting does bring in a lot of people so I can see why other vendors would love to use it to get people into their booth! Before I go on, I must make something very clear. Keeping other "free" painters out of the fair was NOT solely for the purpose of ensuring that I make ALL the money. Of course that is one factor...if everyone were to offer free face painting, I simply would be run out of business. I pay close to $500 to be at the fair for a week between booth fees, parking, entrance fees, supplies, and liability insurance, not counting the gas I guzzle driving 3 hours a day to get there and back home. The unfairness is pretty obvious to people in this regard. It would be like a gym opening up an office right next door to a flower shop, and then offering free flowers as a way to get people to come into their gym. They surely could offer literally anything else for free that doesn't eat away at their neighbor's business. But of course the flower shop is stuck...they can't just turn around and sell something else the next day. Just really tactless. The biggest reason besides sheer numbers (which I know I can't deny...a business must make some profit to exist and I am already teetering on the line of just breaking even), is my company's reputation and liability. Reputation My company's reputation for top notch quality is something I have spent nearly 18 years building up. People come back year after year for my face painting at the fair. Every year I have painted teenagers who still remember me painting them as toddlers. (boy that makes me feel old!) A reputation for excellence is not something that you can buy or achieve overnight, yet it can be quickly broken down in the wrong environment. Yes, those teenagers know exactly where to come in Building 22 for an awesome face painting each year at the fair. But as new families and younger kids come in each year and are snagged by a free painter before they reach me, other new families see them walking around the fair with really poorly done face paintings. Then they walk by my booth and naturally think, "oh, that must be where they had their face painted." And there's a blow to my reputation for quality, and a guarantee for it to continue to erode year after year. The average customer has no idea of the dangers of inexperienced face painters. I know if I weren't so steeped in knowledge of the business and the products themselves, I too would think, "well they are here painting for the general public...surely they know what they are doing!" 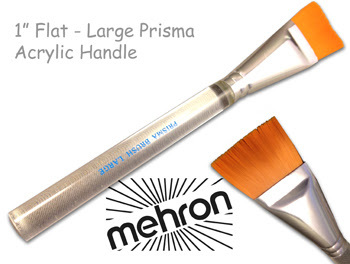 I am shocked at how many times I have seen people painting at events with dangerous products. Inexperienced face painters, most often seen where face painting is being offered for free, often use acrylic paints, craft paints, or tempera paints, none of which are safe for use on skin. I even know of other "professionals" who add tempera paint to their "real" face paints to stretch them farther. 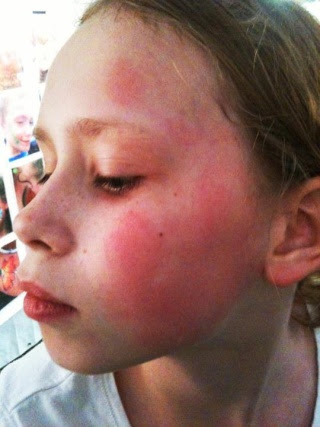 The words "non-toxic" mean nothing on a jar of paint when it comes to putting it on your skin!! Parents, please read this previous blog post to educate yourselves further regarding the dangers of "non-toxic" paints, and be an advocate for your child's safety. And if you are not sure, don't be afraid to ask the painter if they are using paints and glitters that are FDA approved for cosmetic use. If they reply, "oh, it's non-toxic, I have been using it for years with no problem," there is a huge red flag!! 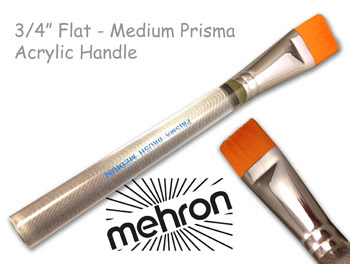 I ONLY use high quality, professional paints and glitters, FDA approved for cosmetic use. 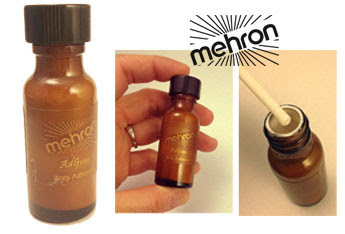 Glitters too can be very dangerous if they are using metallic glitters found at craft stores. 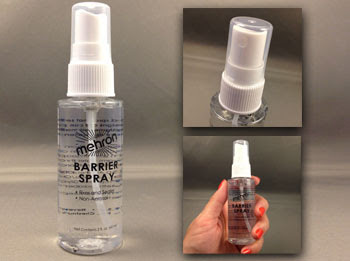 These glitters can scratch a child's cornea and cause serious damage. So now that I have explained some of the dangers, you can see where the liability comes in. If someone comes to the fair and gets their child's face painted for free, and that child has a severe reaction or injury, they will call the fair to find out who their face painter is to point blame. And where will their research point them to? The face painter who has followed the rules and registered their product with the fair in their contract....Paintertainment. I simply cannot in good conscience support an organization that is not showing regard for the safety of my customers or respect for my business in general. Now the money thing does come into play still as everyone knows the purpose of a business is to make a profit. But with the cost to be in the fair going up every year, and my total sales remaining pretty much the same every year for the past 15 years, an inability to afford being at the fair was bound to happen eventually. This whole free face painter thing just put it into fast forward, shoving me out the door before I was quite ready or prepared. For the past few years I have been just teetering on the line of making some profit, getting so close to a break-even point, that I just can't afford to have anything else eating away at my business or threatening me with lawsuits. I'd love to be able to hire artists who live closer to the fair to keep it going, saving me the time and money of driving from Mound to Farmington and back each day. But the profit margin is so small now that there just isn't any extra income to be able to pay people to man the booth. And so, as you can see, I am stuck. My Final Farewell and Thank You's! As I said, I really wish I could have done something extra special for my last year, had I known it was coming so quickly! I did put hundreds of dollars into re-designing and updating my booth last year to help commemorate my 15th year. But I would have loved the opportunity to have personally thanked each and every one of you one last time as I painted your children last summer! So, I am sad to have had to leave the fair in such an abrupt manner, and just want you all to know how much I have enjoyed seeing and painting your faces these past 15 years! I have truly appreciated your support year after year. 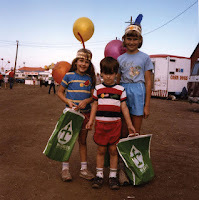 There will always be a special place in my heart for the Dakota County Fair! I have attended this fair EVERY year since my BIRTH! I have entered countless pieces of art in the art show and still have a box full of ribbons from kindergarten through adulthood. I have tons of happy memories of visiting the fair with my family as a kid, collecting freebies in the commercial buildings, and Dad treating us each to a sucker at the heavenly smelling booth "Lollies by Lee." It was where Paintertainment began, and where I returned each summer even after getting married and moving away to Ohio for 4 years. 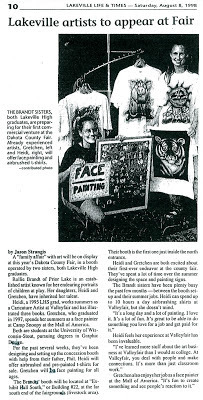 It was a family labor of love, as my dad built the first booth that I shared with my caricature artist sister, where my brother worked as a cashier, and where my mom has helped keep the booth running as my face painting partner for the last 9 of those years. It is where I spent several summer date nights with my boyfriend, now husband of almost 14 years, and where we now take our own two little boys for summer fun! So, I leave with no hard feelings towards the fair as I know that all good things must come to an end. If you are a commercial exhibitor and would like to hire a legitimate, insured, safe and quality face painter as a freebie for your booth guests, feel free to contact me! I am excited to embark on a new adventure this year, painting faces at the Carver County Fair in Waconia, much closer to where I now live. If you're up for the drive, come on out and visit me in the commercial building! And if you live in Carver County and are regular attenders of the Carver County Fair, I hope to see YOU this year and start a new annual tradition for your family! !